This section is dedicated to Henry V, the play by William Shakespeare. 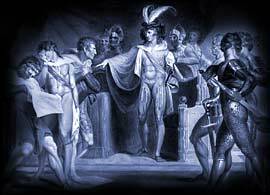 The picture is 18th century and image displayed represents the essence of the play which, we hope, will bring to life a famous scene or character from Henry V. The information provided in this section of william-shakespeare.info includes famous quotes / quotations, summary of the plot or story, facts about the play, a list of the cast and characters and access to the full text - script. King Henry IV has died and his son Prince Hal reigns. It's war with France and all England rises up to back the King. At the city of Harfleur, the King and his forces encounter stiff resistance and King Hal rally's his forces with the patriotic rallying speech "Once more unto the breach, dear friends, once more..." England is united under Henry's leadership and win Harfleur. He then goes on to win the Battle of Agincourt and the French King surrenders. He offers Henry the hand of his daughter, Katherine of Valois, in marriage so uniting England and France. After he marries Katherine, peace rules, and they have a son. However, after King Hal dies and his son becomes Henry VI, war again looms on the horizon. there was a huge demand for new entertainment and Henry V would have been produced immediately following the completion of the play. The number of words in the script, according to the Complete Public Domain Text is 27,684. The quotes from Henry V are amongst Shakespeare's most famous including 'Once more unto the breach, dear friends' and 'Cry ‘God for Harry, England, and Saint George!'. Details of these famous quotes follow, complete with information regarding the Act and the Scene, allowing a quick reference to the section of the play that these quotations can be found in. Please click here for the full text of the script of the play. Henry V was based on real people and events taken from English history. The characters are from the royal Houses of Lancaster and York.